This is perhaps the best thing I've ever baked. I present to you: Vegan Blueberry Banana Bread with Walnuts. It is the perfect special treat to make when you have nothing special on hand. For real. I used 2/3 of a bag of blueberries from our winter CSA that were hiding out in my freezer since God-knows-when and a bunch of truly skanky bananas. 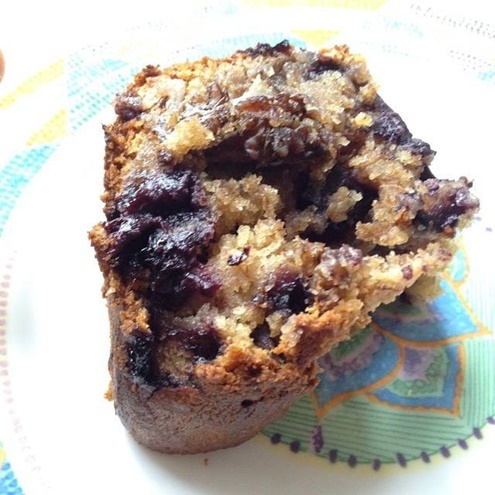 This recipe is inspired by, and adapted from, the banana bread recipe in How It All Vegan, my go-to cookbook for making basic dishes that taste outstanding. Using a paper towel (or your fingers if the coconut oil is cold/solid), smear a little bit of coconut oil onto a loaf pan. Use silicone loaf pans as a healthier alternative nonstick pans. In a medium bowl, mash bananas with a potato masher until super mushy. Stir lemon juice, coconut oil, and sugar into bananas. In a large bowl, stir together flour, salt, baking powder, and baking soda with a fork. Add wet ingredients to dry. Stir until just mixed. Fold walnuts and blueberries into batter. Put into the greased loaf pan. Bake for an hour or a little more, until a knife stuck into the middle comes out clean (except for the blueberry smears). Let it cool in the pan on a cooling rack for 10 minutes. Then remove from pan and let it finish cooling or just gobble a steaming hot end piece like I did. Yes, my loaf sort of fell apart as a result but it was totally worth it. Did you bake this? Blueberries and bananas: perfect together, amiright? Have you made anything from How It All Vegan?